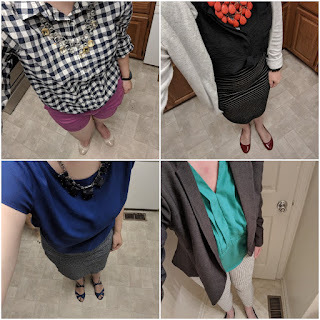 This will never be a legit fashion blog, but What I Wore posts are just too much fun! Here's a sampling of some of my favorite outfits from June. It's been fun to dress for a new work environment and play around with a bunch of new clothes this month. My mom got me clothes for my birthday, I bought some new workwear for the new job and I got a big bag of hand-me-downs from a friend. If you follow me on Instagram, you've already seen these. There were other favorites that I just forgot to photograph. When I take records like this of my outfits, I definitely see that I tend to always want at least one pop of color, a print, or both!